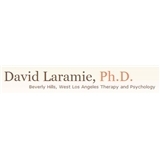 David Laramie, Ph.D. (Beverly Hills) - Book Appointment Online! Perhaps you need someone to listen to you, someone to help you feel safe, someone to guide you in understanding what goes on in your mind and in your life. Maybe you would like to have less pain and confusion in your life. Perhaps I am the therapist to guide you to that life. Together, you and I will make sense of your feelings and thoughts, including the confusing and difficult ones, and figure out ways to help you achieve your goals for wellness. Many people enjoy having a place where they can talk about their stress without being judged. I have expertise and experience in working with general concerns that affect everyone, such as depression, anxiety, and relationships. I also have particular specialties in eating disorders, mind-body concerns, and unhealthy technology use. Please note that I am only able to see Medicare patients in my Beverly Hills office.